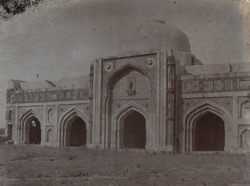 Photograph of the Jamali Kamali Masjid at Delhi from the Archaeological Survey of India Collections, taken in the 1880s and attributed to Henry Hardy Cole. Although the photograph is credited to Cole, it was probably not in fact taken by him; a possible candidate is W. Caney, who took photographs of other sites in Delhi included in the Survey. The mosque is situated in the Mehrauli village district outside the Qutb complex in southern Delhi and was built between 1528 and 1536 by Shaikh Fazl al-Allah, also known as Jalal Khan Jalali or Jamali. He was a poet and saint at the court of rulers from Sikandar Lodi (r.1489-1517) to Humayun (1530-40 & 1555-56). He died in 1535 and his tomb stands in an adjacent compound. The mosque is built of red sandstone with white details and is among the most beautiful of early Mughal mosques.